Yamaha announces the availability of its new TransAcoustic hybrid pianos, a new series that features an upright and a grand pianos. Bösendorfer's new SP 155 Grand was on display on Yamaha's booth at the NAMM show. Yamaha adds the 6’1” C3XA and the 7’ C6XA to its line of Conservatory Grand Pianos at Winter NAMM 2012. The Disklavier Pro Series includes technologies including a Sound Muting System, XG instrument tone generation, MIDI and PC connections, a SmartKey play-assist system, expanded memory, and a pocket remote control. Yamaha introduces the Bösendorfer 200DE3, the first non-Yamaha piano to feature the company's Disklavier performance reproducing technology, which is integrated inside the new model. 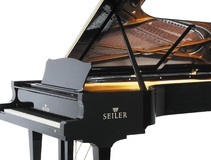 To celebrate its centenary, German automaker Audi teamed up with Austrian keyboard builder Bösendorfer to produce a grand piano, which Yamaha displays in its piano room at Winter NAMM 2011. New Semiconcert Grand from Steingraeber & Söhne.